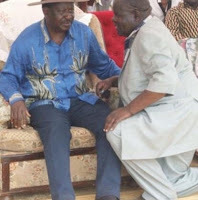 Friday February 8, 2019 - Self-proclaimed National Resistance Movement (NRM) general, Miguna Miguna, has once again lashed out at Homa Governor, Cyprian Awiti, who is battling a dangerous disease that has enlarged his tummy and deprived him of his sight. On Thursday, the Supreme Court upheld Awiti’s win and this did not go down well with Miguna Miguna, who is beating cold winter nights in Canada after he was deported by the Kenyan Government last year. In a post just moments after Awiti was declared duly elected, Miguna attacked him for allegedly engaging in primitive politicking. He bashed the latter over his links with NASA leader, Raila Odinga, Miguna's ally turn foe. He further accused the Governor of presiding over poverty in his County and leading a County deeply rooted in graft and looting of public funds. "Cyprian Awiti epitomizes Kenya's depraved, primitive and hopelessly rotten politics of patronage where grown men and women kneel, grovel and crawl on their extended tummies to survive after looting public resources and rendering their own people destitute," Miguna said.